Our dental hygienist and therapist are highly-trained dental care professionals who focus on preventive oral health, listening to concerns of our patients and giving care and guidance. Prevention and treatment of gum disease is dependent on excellent co-operation from the patient. It is our role to ensure that patients become actively involved in the therapy rather than just being passive receivers of treatment. Here at Beeston Dental Practice and Implant clinic prevention is key for a life-long healthy mouth. Gum Disease and tooth decay are both preventable conditions, which we will give you the knowledge and skills of how to implement, to stop these for occurring. Prevention is about successfully giving patients control of their oral health. Our dental staff will assess your oral hygiene and dental needs. You’ll have every opportunity to ask questions and we welcome this, to ensure you are completely comfortable during your appointment. We’ll talk you through dietary and lifestyle factors that impact your dental health and advise on the best measures to start at home. We’ll arm you with all of the knowledge you need to maintain healthy, happy teeth and gums. How often should I make a hygiene appointment? We’ll advise you on further visits, but every 6 weeks is usually advisable. This allows us to monitor any changes, warning signs, and advise you on how best to proceed should be find anything of concern. What sort of advice will I receive? Your hygienist will provide you with information about your teeth and dental health. They will assess your gum health, areas of concern, and lifestyle choices to provide you with the best at-home care recommendations. This may include cleaning techniques, products, and lifestyle advice. Gum disease is incredibly common in the UK, but the symptoms may go unnoticed until they become very uncomfortable. The symptoms of gum disease include a swollen and red appearance, tenderness and bleeding while brushing. You may also notice that your gums are receding or pulling away from your teeth, and that your teeth are becoming looser. What is a treatment coordinator? 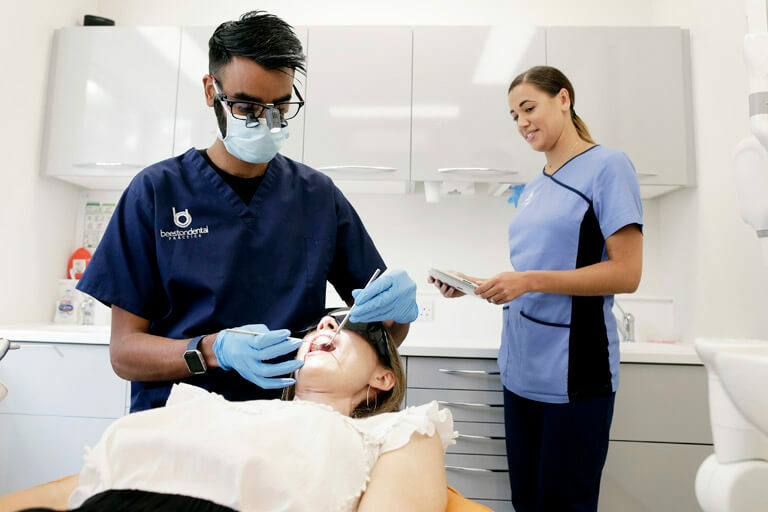 Seeing one of our treatment coordinators, who are also experienced dental nurses, allows you to discover more about any proposed treatments we recommend. They are specially trained to give you the support and advice you may need when making a decision regarding a potential treatment. These sessions take place in our dedicated meeting room, a non-clinical environment when calm discussion can take place. Why should I see a treatment coordinator? We appreciate that some dental treatments, like dental implants and CEREC crowns, can represent an investment to some patients. A session with one of our treatment coordinators allows an open and honest discussion to help you decide whether or not a treatment is suitable or beneficial to you. Also, for any nervous patients, a treatment coordinator session is a great way to meet members of our team in a comfortable environment, so you can acclimatise to our practice. You can ask questions and receive reassurance at these sessions to make your appointments with us more enjoyable.